DHS: Violence, poverty are driving children to flee Central America to U.S.
Of the thousands of unaccompanied children apprehended at the U.S. border in recent months, many can be attributed to poverty and regional violence in three Central American countries, a new U.S. Department of Homeland Security document finds. The document says the reasons driving the migration are different for each country, attributing it to local conditions. 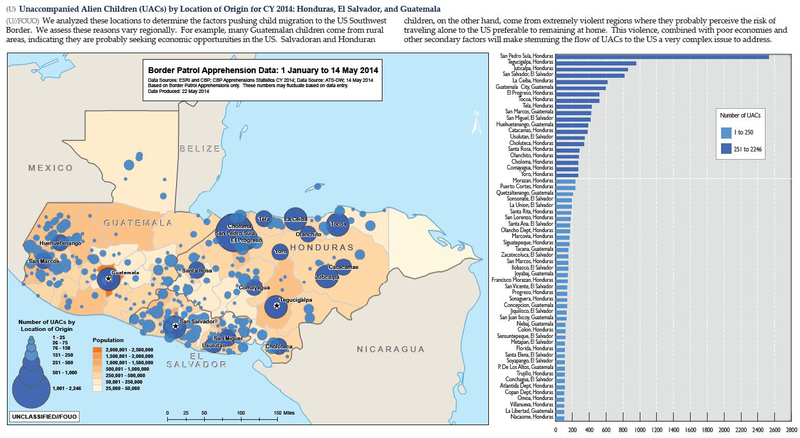 The three top municipalities sending children to the U.S. are all in Honduras. San Pedro Sula leads the list, with more than 2,200 unaccompanied minors apprehended between January and May of this year, making up at least 5% of all apprehended children since October 1st. Following San Pedro Sula are Tegucigalpa and Juticalpa, both with more than 800 apprehended children during the same period. The Honduran and Salvadoran child migrants are from some of the most violent regions in those countries. San Pedro Sula in Honduras is the world’s murder capital, with a homicide rate of 187 homicides per 100,000 inhabitants in 2013 driven by a surge in gang and drug trafficking violence. 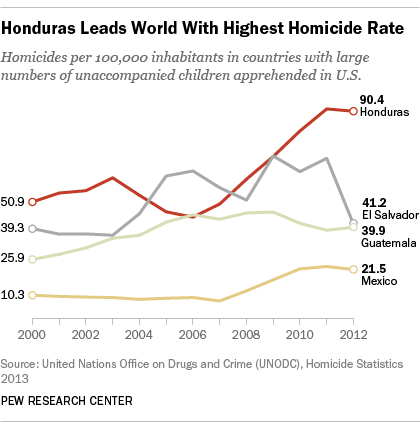 For the entire country Honduras’s murder rate was 90 per 100,000 in 2012, the highest in the world. In 2011, El Salvador was not far behind, at 70, ranking second in terms of homicides in Latin America then. Even with a significant drop in the murder rate from 70 in 2011 to 41 in 2012, El Salvador is only surpassed by Honduras, Venezuela and Belize in the entire world. Homeland Security also points to poor economies as another factor pushing children north to the U.S. Overall, Honduras, Guatemala and El Salvador are among the poorest nations in Latin America with 30%, 26%, and 17% of their people living on less than $2 a day, according to the World Bank. 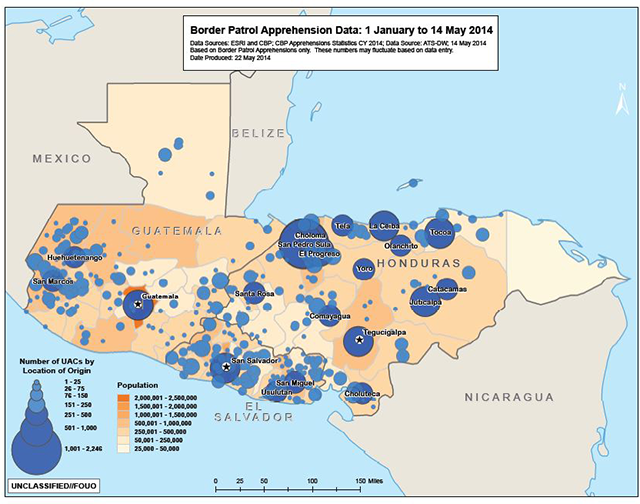 Unaccompanied minor children are not just from Central America. According to the Department of Homeland Security, more than 11,000 children from Mexico were apprehended between October 1, 2013 and May 31 of this year. However, the recent surge in apprehensions of children has been driven by increases in the number coming from Central America. Ana Gonzalez-Barrera is a senior researcher focusing on Hispanics, immigration and demographics at Pew Research Center.